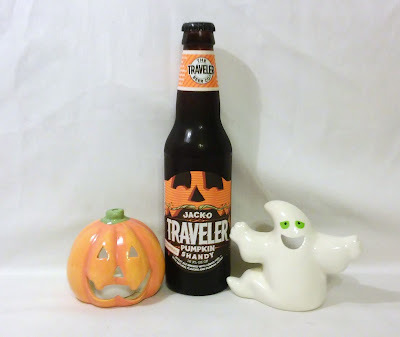 Jared Unzipped: Brew Spew 2015 Part 5: The Traveler Beer Co. Jack-O Traveler Pumpkin Shandy. Brew Spew 2015 Part 5: The Traveler Beer Co. Jack-O Traveler Pumpkin Shandy. At last, we've arrived at the fifth and final part of the Brew Spew 2015. Over the course of the past few weeks, we've analyzed together four different seasonal beers. So far, only one of those beers was a stinker. With tonight's fifth installment, let's hope we find another enjoyable Autumnal beverage. 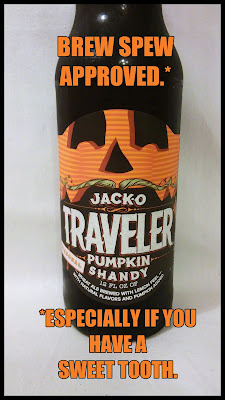 The final featured beer is Jack-O Traveler Pumpkin Shandy from The Traveler Beer Company of Burlington, Vermont. Traveler is famous for their various fruit-themed beers like the Forbidden Traveler Apple Ale and the Curious Traveler Lemon Shandy. 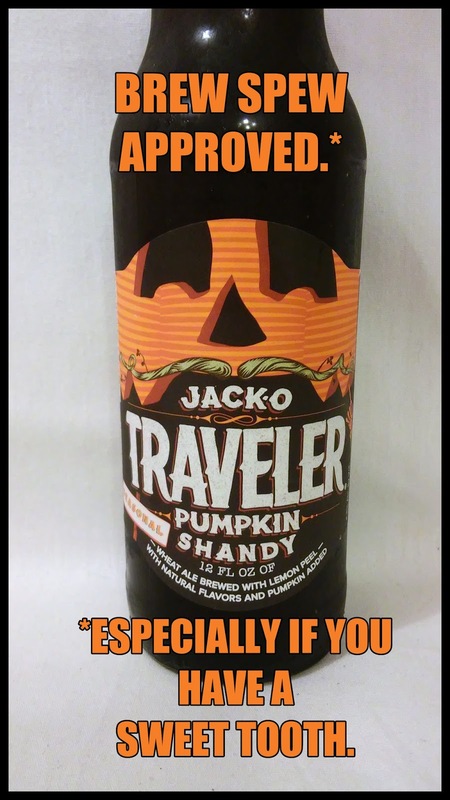 Jack-O Traveler Pumpkin Shandy is a wheat beer that's 4.4% Alc. by volume and available annually during the Fall months. It features genuine pumpkin in the brewing process. As with the previous reviews, I'll be taking notes live as I drink the beer for the first time. The comments will be broken up into two sections. My comments will be genuine. I'll notate what I like and dislike about the beer. Honesty is key! Let's begin, shall we? It has a golden yellow color. Lots of bubbles and fizz upon pour, with a very thin foam head. Has a faint citrus smell, along with some other strange scent that I simply I can't describe. Very sweet, with no bitterness at all. Light bodied, but doesn't taste hollow or flat. The lemon flavor is the strongest, closely followed by the seasonal spices, most likely cinnamon and nutmeg. The pumpkin flavor is almost undetectable. Reminds me of a moderately sweet, alcoholic lemonade without any sourness or pucker factor. Easy to drink and quite delightful. I wish the pumpkin flavor would stand out more. The cinnamon has become very fragrant. Conversely, the lemon citrus scent has notably decreased. The pumpkin flavor has suddenly appeared, but not where I expected! On the swallow, the pumpkin suddenly strikes all over my tongue and expresses itself. Still very sweet and extremely easy to drink. Has not gotten thin or flat, with a fair amount of carbonation still present. The various spice flavors haven't changed at all, really. The lemon flavor has mellowed out and only become sweeter as well. Not bitter at all; didn't taste the first note of bitterness throughout the entire beverage. This was a surprising beer, to be honest. The Jack-O Traveler Pumpkin Shandy is just about one of the sweetest beers I've ever enjoyed. The lemon flavoring was somewhat bold at first, but eventually succumbed to the overall sugary nature of the beer as it warmed. You could almost call this beer bipolar. Drink it cold and you'll enjoy the lemon side of it. Drink it at room temperature and you'll enjoy the pumpkin side. I do wish it had a more dominant pumpkin flavor overall, but was thankful it became detectable after I let the beer sit for a bit. What shocked me is that the pumpkin made itself known on the swallow, which is a rare event when drinking seasonal beers. This isn't to say I disliked it, though. Quite the contrary -- Jack-O Traveler Pumpkin Shandy is a very luscious, flavorful beer that could easily be enjoyed any time of the year. Jack-O Traveler Pumpkin Shandy is yet another seasonal beer that shouldn't be relegated just to Autumn! Well, that does it for the 2015 Brew Spew. Thanks for coming along with me on this trip. We tried five tasty seasonal beers. Four of them were pleasant and hit the mark. I'd say batting .800 isn't bad at all! If you haven't already done so, be sure to check out the other four reviews. Until next year!